Last month Chivas Regal premièred their short film Drifting in Paradise: A tale of long lost friends at sea directed by Diego Luna online. Ironically I was in Akumal, Mexico less than 30 minutes away from where the first instalment of Drifting was shot. So I missed the launch - but moments ago Chivas revealed the second and concluding short film in the Drifting series directed by Diego Luna's close friend and creative partner Gael Garcia Bernal. Drifting are a short films inspired and created by friends. The film is part of a collaboration between Chivas Regal, the original luxury whisky, and Canana – the arthouse Mexican production company, founded by life-long friends Gael Garcia Bernal, Diego Luna and Pablo Cruz, and led by Julián Levin. In addition to Drifting their current projects include the Oscar nominated No starring Bernal and the upcoming Chavez directed by Luna with an on screen appearance from Bernal. Keeping very much in theme of Chivas's previous films Here's to Big Bear and Here's to Twinkle by Joachim Back - The Drifting collaboration sees modern male friendship brought to life through two short films, the first directed by Diego Luna and the second by Gael Garcia Bernal. 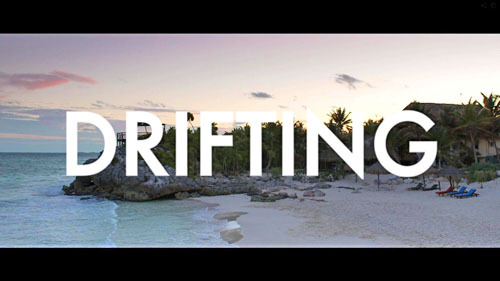 Filmed in Tulum Mexico, Drifting, tells the story of three life-long friends, Nico (Pablo Cruz), Andres (Ari Brickmann) and Al (Alexander DiPersia). The short explores themes of trust, forgiveness and acceptance as the characters reconnect after drifting apart and find themselves falling straight back into the comfort of old friendship. An unexpected story unfolds as Nico and Andres embark on an adventure to lure their friend Al away from an idyllic paradise, where his new life as a laid back and carefree hotel owner has meant he has lost touch with reality and his old life and friends. With old friend Nico’s impending wedding, the friends want to make sure Al gets back for the big event, and aim to convince him with a surprise visit and an elaborate prank. Along the way they reminisce about a past beach holiday they took together when they were younger, reminding them of their long, solid friendship. Directed by Diego Luna, Drifting is the first in a two-part film collaboration between Diego and best friend Gael Garcia Bernal. The film explores the lengths friends will go for each other as two guys plan a surprise reunion for their best friend. Directed by Gael García Bernal, Drifting Part 2 is the conclusion of the short film collaboration between Gael and his best friend Diego Luna. Learn what happens to a friendship pushed to the limits. 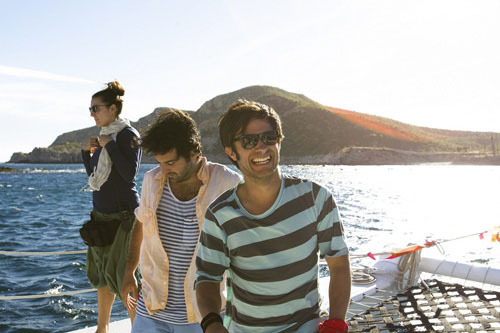 Filmed in Cabo San Lucas, the concluding installation of Drifting finds life-long friends, Nico (Pablo Cruz Guerrero), Andres (Ari Brickmann) and Al (Alexander DiPersia) floating in the middle of the ocean with just a life preserver between them after an unexplained prank. While the characters try to figure out what has happened and what to do next, the short explores themes of trust, forgiveness and acceptance as they reconnect. As the tale unravels, it reveals an elaborate set-up culminating in a surprise ending that makes the friends realise the importance of making time for friendship. Gael García Bernal has stepped behind the camera to direct Drifting: Part 2, which picks up where friend and Canana co-founder, Diego Luna, left off in this two-part short film. Drifting: Part One, directed by Luna, sets up the story of three friends who reunite after having drifted apart. A prank sees the friends left in a precarious situation, which Bernal has to resolve in the concluding film. The two-part short film is part of a collaboration between Chivas Regal, the original luxury whisky, and Canana – the art-house Mexican film company founded by life-long friends Gael García Bernal, Diego Luna and Pablo Cruz, and led by Julián Levin. Drifting brings to life the idiosyncrasies of modern male friendship – a theme the Canana team knows well. The friends and business partners worked collectively to develop the storyline, directing and producing the films in their native Mexico. As part of the project, Chivas is celebrating real-life friendships by sending two friends on an all-expenses-paid trip to the legendary Cannes Film Festival, of which Chivas is an official sponsor, for a special screening of Drifting. The We Go Way Back photo competition, open from the 18th February through to 24th March 2013, asks fans to upload pictures of them and their best friend, showing moments of friendship and shared memories. In the gallery showcasing entries, people can vote for their favourite submissions until 31st March. The winner will be selected from the ten submissions with the most votes by Canana. To enter the competition head here! Both Diego Luna and Gael Garcia Bernal’s films, along with sneak peeks behind the scenes with Diego on set as well as exclusive interviews, can be viewed at www.chivascanana.com.